Nothing is certain, but blood pressure does increase in the end of winter and beginning of spring. According to Aurametrix users and google statistics. 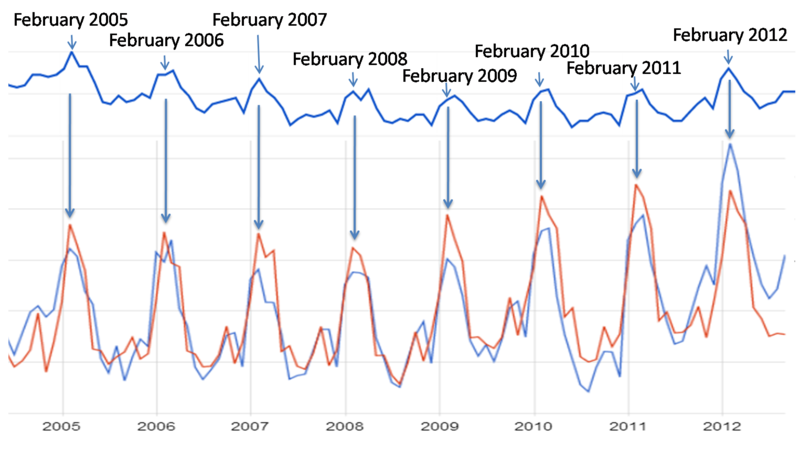 As a matter of fact, it highly correlates with tax fever - as found by Google Correlate algorithm comparing millions of web queries - see the figure on the right with searches for property taxes shown in red. Or check it yourself! But the reason for raising blood pressure is not always taxes. Seasonal variation in blood pressure was noticed and described more than 50 years ago and was connected to periods of decreasing outdoor temperature. It happens to healthy individuals and those who suffer from high blood pressure, especially in the elderly. The figure shows fluctuations in blood pressure observed by French researchers in a large study of 9294 65+ old residents of Bordeaux, Dijon, and Montpellier. 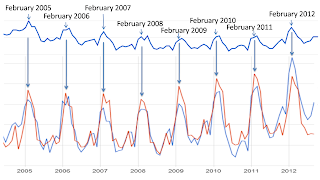 Both systolic and diastolic parts of blood pressure as well as heart rate measurements significantly differed across the seasons with a clear trend for increase in colder months. And decreases following warmer weather - the higher the temperature, the larger the blood pressure decreases. Changes in blood pressure relative to outdoor temperature were largest in the elderly (80+ years old). 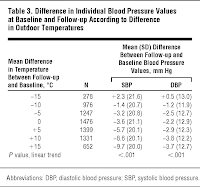 On average, for a 15°C decrease in outdoor temperature, Systolic blood pressure (SBP) increased 0.8 mm Hg in those aged 65 to 74 years compared with 5.1 mm Hg in the oldest group (≥80 years). For a 15°C increase in temperature, SBP decreased 9.9 mm Hg in the youngest group vs 13.8 mm Hg in those 80 years or older. Winter increases in blood pressure did not seem to be caused by increased alcohol consumption and decreased activity. Neither were they dependent on the indoor temperatures - spending over 12 hours in warm rooms did not help. 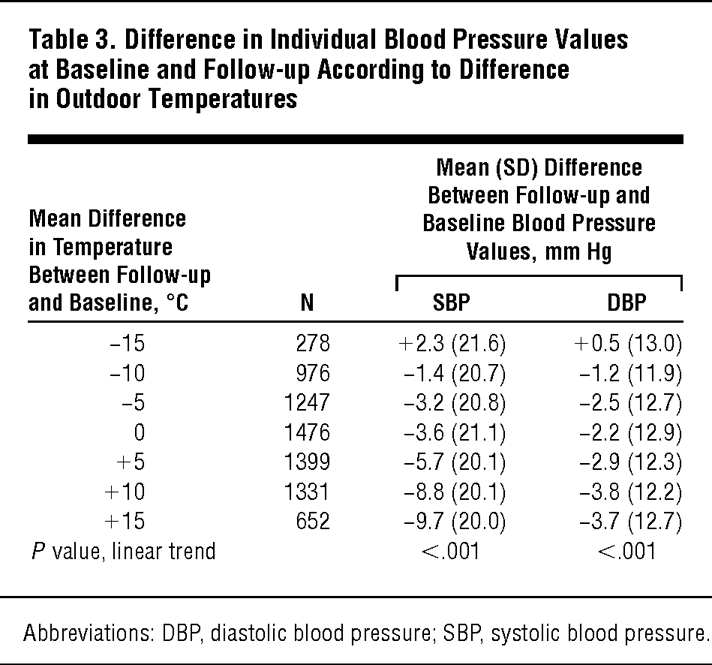 The inverse correlation of blood pressure and outdoor temperature is even stronger for "apparent temperature"- aka the perceived coldness derived from the combination of temperature and wind. And it was observed all over the world - as documented in studies performed in US, Denmark, China, Japan... Possible explanations include direct thermoregulation-mediated vasoconstriction, hypothalamic-pituitary-adrenocortical axis (HPAA) and sympathetic nervous system (SNS) activation, sodium/volume retention and impaired endothelial-dependent vasodilatation. Reduced sleep duration or quality could be also contributing. Environmental hypertensionology is a very young science. Many things in our environment can cause high blood pressure. The exact mechanisms are not well understood, but systems like Aurametrix could utilize the wealth of empirical evidence and use it for prediction and prevention. The high blood pressure season is almost over. Fortunately, many critically ill people made it through and, hopefully, learned more. Let's gear up to make the next time easier. As far back as concrete began, it has known to hints at staining and pulls in stains. Notwithstanding, with the appearance of innovation, valuable strategies have been created to help concrete cleaning service in indianapolis reestablish its unique shading however much as could be expected. Your article helped me a lot in absorbing all the statistical information about environmental health. I really liked your article. keep sharing more of such good information. Offering a Comfortable Shirdi tour packages, we ensure that all our Guest have a hassle free trip Sarting the tour by 8 to 8.30 AM from Pune Airport , we transfer you by AC Pushback bus to a most comfortable and relaxing stay in Shirdi 3 Star or Deluxe hotel, making your wait to have darshan of baba come true with visit to Sai baba's Shrine you can also visit Dwarkami the most important place to visit in shirdi dwarkamai is where baba stayed till the end of his life . The tour package also takes you to the unique and the most powerful Shani temple in India - Shanishingnapur, & Ranjangaon Ashtavinay Temple one of the eight Swayambhu Ganpathi temple located near Pune. At Shirdi Sai Holidays, we provide Shirdi Package with personal interest in providing quality customer service and making sure your travel experience is both enjoyable and rewarding. Here we give you the opportunity to discuss in comfort all aspects of your travel arrangements with our consultants and managers. Take the opportunity to speak to any one of our friendly and knowledgeable consultants. We deal exclusively with Bangalore to Shirdi Package by bus and flight. Those who register online will not have to stand in the darshan queue for more than an hour. They will be told the approximate time when they can pay their respect and will be able to finish their visit within an hour of the time mentioned. Those who do not book through this Booking System will have to stand in the regular darshan queue. Devotees can also make Online bookings for Hotel Accommodation at Shirdi. The Dwarawati hotel is used for the Accomodation purpose. Previously, devotees had to stand in queue for getting the accommodation tickets. But with the help of present system, they can book their accomodation at Dwarawati before time at an affordable rate starting from Rs. 500. Those devotees, who want to attend the Artis of Baba at the Samadhi Mandir, can also reserve before time with the help of the Online booking system. For more information and Online Booking, go to this link https://online.sai.org.in/. Devotees need to be first register themselves in the Website and create an Account, after that they can select the Online services like Darshan, Accomodation, Donation, Annadan etc and make their payments online through the appropriate payment gateways. If you have just heard about the efficiency of a comprobar correo tool, then you probably want to find one that can offer you just the right advantages. When it comes to comprobar email, this task can seem quite overwhelming, because there are just too many options out there.